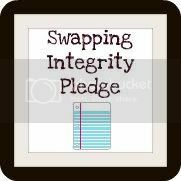 I, Jody, pledge to do my very best to have integrity and honesty in my swap commitments. To be on time, to participate in discussions, and to communicate if I am going to be late or unable to complete my obligations to my swap partner. Such a good idea, everyone who swaps should pledge to do the same, or at least commit in to themselves to do the same. I've been very lucky, so far, with swaps and have received something from everyone I've swapped with (and have sent something to everyone!). Here's my confession of the day though: I participated in a swap recently and sent my items out last weekend. The swap was an Easter swap and I had a hard time finding Easter stuff before I packed up the items, so I had to fudge a bit (supposed to send a mug ... I could not find an Easter one, not even at a ceramics store or a thrift store, so sent a simple white mug with a pink ribbon on it). Also, one of the packages was going out of the country and, with a mug in it, I was concerned about weight and cost, so I didn't add in any extras beyond what the swap required. I just feel like I could have done more. I did tell the swap Mama and she reassured me that I did fine ... it's just bugging me a bit. Head here if you'd like to sign the pledge. I just had a bee end that completely fell to pieces... it stunk! And I feel so bad for anyone who had a month in the last half because they didn't get hardly any of their stuff back, and the bee mama didn't seem to be too concerned. I think everyone needs to take this pledge!